These are my aunts Anna and Rita. They cook an amazing meal for at least ten members of our family every Christmas Eve, and all of us love them very much. A lot of my friends ask me to email them photos of our annual feast, and so I decided to make it easy and upload a bunch here. I hope you all had a great holiday. We did. I came across some lard bread in the morning and couldn't pass it up. Neither could Joanna and Josephine. Anna's baked clams. One day I hope to make them as good, but I'm not holding my breath. Rita's angel hair with garlic, hazelnuts and almonds. Simple and perfect. Rita and Joan's fried shrimp will make you weep. Two platters and not a single shrimp was left. It's not Christmas Eve without seafood salad, and Anna's is excellent. So much so that these two are always sliding it to their side of the table. These mussels were a surprise dish. Simple and extremely tasty. Broiled baccala with cherry peppers. Love, love, love it. Also a baccala salad. Even the non believers were all over this salad; it was terrific. Cousins Alec and Joan discuss strategy over the next dish to show up. Will they or won't they? Stewed eel with olives and prosciutto. They did eat it. So did everybody else. One of the best eel dishes I've ever had, and I eat plenty of eel. And of course a couple baked lobsters. Just in case we were still hungry. I've said this before: Josephine may be the finest baker that I know. I always look forward to her Christmas cookies and biscotti. Christmas Eve is also her birthday, and Goombah Joe remembered. Anna went above and beyond this year and surprised us all with homemade pasticiotti. I damn near cried. Yeah, we had a little wine. Just ask cousin Frank, he'll tell you. We'll be back next year. I hope. If you have an interest in this traditional Christmas Eve feast, click on the link above and you will be transported to Aunt Anna's and Rita's table. Me? I will grudgingly accept the idea that other traditions exist, and move forward as best that I can. Panforte may not be the best known Christmas sweet, but it is among Italy's oldest. Basically a round, flat fruitcake, panforte is said to have first appeared in ancient Tuscany, in Sienna, possibly as early as the 1200s. Panforte means "strong bread," referring to its spicey flavor. However, "strong" also describes the cake's sturdiness and, if stored properly, longevity. Enough with the history lesson, let's make us some fruitcake. I'm not going to lie to you. This is the first panforte I have ever made. Despite this, I decided to wing it. The recipe I referred to, specifically for technique, was from Nick Malgieri's "Great Italian Desserts." However, enough got changed in my version that I doubt Nick would approve and so don't blame him if it doesn't work out, blame me. Here you have a mixture of hazelnuts and almonds (3/4 cup of each), plus diced candied orange peel (3/4 cup) and citron (1 cup). The nuts get lightly toasted and then mixed together in a bowl with the orange peel and citron. In a separate bowl mix together flour (3/4 cups), cinnamon (1 teaspoon), and 1/4 teaspoon each of coriander, cloves and nutmeg. Now would be a good time to preheat your oven to 300 degrees F. And line a 10-inch pie pan (with removable bottom) in parchment paper. Butter the parchment and an inch or two of the inside wall of the pan. In a saucepan add honey (3/4 cup) and sugar (1/4 cup). Mix together and then warm at a low flame. Allow this to boil for about 2 minutes. Pour the boiled honey and sugar over the nuts, orange peel and citron and stir together quickly. Then add the flour and cinnamon mix and stir thoroughly. Pour into the baking pan and begin to spread evenly throughout. Using wet fingers complete the even distribution of the mix. Mix together flour (2 tablespoons) and cinnamon (1/2 teaspoon). Using a sifter cover the entire panforte with the mixture, then place in the oven. Start checking on it after 25 minutes or so, but the panforte could take longer than that. This one was in the oven for 45 minutes. You can see that the flour-and-cinnamon mix remains; just brush it off. At this stage you've got yourself a completed panforte. All you need to do now is lightly apply confectioners sugar just before serving. If tightly wrapped the panforte will keep for weeks. And there you have it. Not exactly the Seven Fishes, but a fine holiday treat nonetheless. A multi-course meal consisting of Frank's favorite foods, in honor of his birthday. On the wall in front of me, just above the printer that hasn't worked since the day I plugged it in three years ago, hangs a framed Life magazine from June 25, 1971. "Sinatra Says Good-by and Amen: A farewell to 30 very good years," the headline reads. A silhouetted cover shot shows a fifty-fiveish Frank wearing a powder blue PGA golf cap, waving and looking just a little bit put upon by the camera's presence. Next to this is another frame. It holds the program from the last time that I saw Sinatra perform, at Radio City Music Hall, in the fall of 1992. The ticket stub is pasted below it and next to that are four torn pieces of notepaper. Scribbled on the sheets, in very precise order, are the titles to each one of the 22 songs the man sang that evening, a thoughtful gesture from the fine woman who accompanied me. I could go on this way for awhile, but you get the idea. I liked the guy. Quite a lot. When the news broke that he had died, in the spring of 1998, I was exactly where I am today. Sitting at my desk, transfixed by the magazine on my wall, the one that documented the (mercifully short-lived) retirement of the world's greatest-ever singer of popular song. I miss Frank. Not a day passes that I do not hear his voice, if only in my mind. It is a fine voice, at once confident and exposed, reckless and deliberate, bullying and good hearted. The world is better with such a voice echoing through it. I hope that I never stop hearing it. I often wondered what it might be like to have shared a meal with the man, at a table filled with the foods that he most enjoyed. Such a meal may have taken place at Patsy's in midtown Manhattan. It is here, after all, where Frank and his many friends so often dined, at least at a point in his life. He had a lasting bond with the restaurant's founder, Pasquale "Patsy" Scognamillo, you see. Why would he not? Once, in the early 1950s, during a dark and lonely time in his life and career, Sinatra found himself all alone and with noplace to spend Thanksgiving. Learning this, Scognamillo, whose restaurant was supposed to be closed for the holiday, decided to open it so that his best customer and friend would have a place to spend the holiday. To make certain that Frank would not be sitting alone in an empty restaurant, Scognamillo gathered the families of his relatives and all his workers, plus as many other people as he could corral, to celebrate Thanksgiving Day at Patsy's. All on just a day's notice, and without his friend's knowledge. We should all be so lucky to acquire friendships such as this. To honor Frank's birth, which occurred on December 12, 1915, I set about to uncover the man's favorite foods. The idea was to prepare the dishes in my own kitchen, and then serve them to my friends. I consulted (of course) the "Patsy's Cookbook," which clearly spells out what Sinatra's favorite foods were: Clams Posillipo, Stuffed Artichokes, Arugula Salad, Fusilli with Garlic and Anchovies, Veal Cutlets Milanese and, for dessert, Lemon Ricotta Torte. I learned a few other things from reading the Patsy's cookbook. 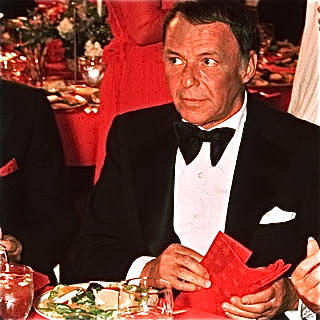 Sinatra liked meatballs but insisted (as do I) they be made with veal. He too used the tomato to gauge a kitchen's skill level: "When you go to a new Italian restaurant, you should always try pasta with tomato sauce first," he told his daughter Nancy. "If the sauce isn't good, the rest of the food won't be either." He liked his veal cutlets paper thin, a concept I strongly endorse, and preferred always a light touch of garlic, a notion that I cannot so much get behind. He enjoyed a good sfogliatelle and pasticiotti. You may already know how I feel about good sfogliatelle and good pasticiotti. JOE: Why did you really retire in '71? JOAN: Don't you just want to slug the singers who channel your style and make like it's their own? FRED: Did you really like the ribs at Twin Anchors in Chicago, or did you just stumble in drunk one night after a gig at the Pump Room? SCOTT: Regrets? Only a few? Really? JEFF: Would you honor this picker with a duet? JOE: Why didn't you ever do the album with Ella? LARRY: Hey Frank, Ava or Marilyn? RICKLIE: Is it true that the best was yet to come? And if so, what's it like on the other side? BILL: Did Momo give the order? KITTY: Why is it called a rubber tree plant? MEATBALL: Before we crack open another bottle of Jack, would you mind singing "East of the Sun" for me — with the twice-repeated coda at the end? Frank's birthday dinner took place last night, at my home here in Maine. So that the foods on our table could closely resemble the ones that Frank enjoyed at his old hangout, every dish was prepared using the recipes from Patsy's restaurant. Clams Posillipo (basically steamed in a quick red sauce) is how our dinner began. It is said that Sinatra would often order two or even three plates of the clams at Patsy's. I grew up on Stuffed Artichokes (though always at the end of the meal). Patsy's recipe includes chopped gaeta olives and capers, a nice addition to the usual breadcrumbs and cheese and herbs. I can see why Sinatra liked this so much. Fusilli with Garlic and Anchovies. What is there to say? If a simpler vehicle for distributing such satisfying flavors exists I am not aware of it. When I turned to the page in the Patsy's cookbook that marked Veal Cutlet Milanese as Sinatra's best-loved veal dish, I smiled for a very long time. Veal Milanese is a constant in my kitchen. If you have eaten at my home more than three or four times, the odds that I have not made a Milanese for you are approximately zero. You will notice that the Arugula Salad course is served alongside the veal. That's because, in my preparation, the arugula salad is normally served right on top of it. Based on the rest of the meal its finishing touch, a Lemon Ricotta Torte, makes total sense to me. It is a classic, light, not terribly sweet ending to a pretty traditional and simple Italian-American dinner. Sure, it would have been just swell to enjoy it sitting across the table from Frank. But a good time was had by all, I am pretty sure. Oh, and the music playing away throughout the evening was not in any way dissatisfying either. I am not going to bother being humble about this, okay. For some absurd reason I was gifted an ability to produce a fine pignoli cookie. A very fine pignoli cookie. As the holidays approach, I anticipate producing several batches of the chewy, almondy things. Just last week a delivery went out to Shyster Jersey Lawyer Friend. She had intervened on my behalf in a matter of (absolutely no conceivable) consequence. Still, my social etiquette-powered GPS pointed me in the direction of reciprocity. Shyster being rather sweet of tooth, cookies seemed the way to go. A specialty of Southern Italy, pignoli cookies (so named for their outer layer of pine nuts) are a beloved dolce among Italian-Americans, especially around the holidays. It is not always easy to find a really good example of the cookie, as getting just the right texture and degree of sweetness can be tricky. Pignoli cookies must be chewy but not soft; sweet, but mildly so. On the other hand, I can make a damned good cookie. So how hard can it be, right? The full recipe for the dough is below, but there is not much to it at all; it is mainly almond paste and sugar, and takes only a few minutes to prepare. Once it's made just put the dough in a bowl so you can start forming the cookies. In a separate bowl you've got your raw pine nuts. The size of the cookie is up to you, but I make them about two inches around. All you do is pinch a bit of dough with your fingers and begin to form what approximates a cookie shape. You'll see a separate bowl filled with water at the top. It's best to wet your fingers before pinching a piece of dough; things go a lot more smoothly that way, believe me. The only thing left to do now is roll the dough around in the pine nuts. Then arrange the cookies on a baking sheet lined with parchment paper and toss it in the oven. About half an hour later you've got these pretty swell cookies to enjoy. In this particular case it was a shyster lawyer from New Jersey who actually got to enjoy them, but you get the idea.